My-Mountains is the best platform to book unique and authentic mountain experiences. 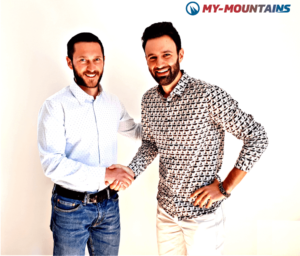 In 2017 we founded My-Mountains in Lucerne, Switzerland as a trusted community marketplace for mountain experiences. Here you can search and book unique mountain experiences in Switzerland and all over Europe. My-Mountains is a dynamic booking platform for your favourite mountain adventure. It connects you to your selected ski instructor, mountain guide or local provider. Skiers, paragliders or mountain bikers; every mountain enthusiast will find on My-Mountains a large choice of unique experiences created by certified, qualified and selected providers. Our international elite Team gathers young professionals, with different skills and strengths, all united under the same common goal: delivering a service that is useful for people, solutions that are exploratory, educational and inspirational. Through us and thanks to all our selected providers, you can easily choose and safely practice your favourite mountain activity. My-Mountains is giving an easy access to a remarkable learning experiences. Explore the mountains like never before, get inspired, go places. Learning is the key to achieving a person’s full potential. It’s important because it boosts confidence, is enjoyable and provides happiness. At My-Moutains we make learning fun, memorable and as smooth as possible. Mountain activities like hiking, mountain biking, trekking, skiing, climbing, and paragliding are activities that boost an individual potential. Our passion for mountains is what makes our hearts beat. A willingness to share ideas to go further - much further. An alpine sports mantra. We help mountain travelers to “experience the mountains” while we keep learning. Understanding our customers is the key to a great experience. Tourism expert with several years of international experience between different continents. Andrea drives the company’s vision, strategy and identify future growth opportunities. He’s dedicated to build a team of world class passionate people to allow My-Mountains to became the most useful website for mountain lovers. Andrea fell in love with the mountains when he was five years old. Ever since he dedicated his life to his mountain passion. Today he’s a tireless skier. In fact, in winter, he’s constantly looking for the best freeriding conditions in the Alps (in Switzerland, Italy and France). While in Summer he loves hiking and trekking in the beautiful mountains of Switzerland. Life is like a ski ride, you must adapt to every turn. Professional in Marketing and Communications, Corinne is responsible to define and implement the marketing strategies of My-Mountains on- and offline. She wants to make sure, that every customer easily finds an unique mountain experience on the platform. In order to achieve this goal, she constantly analyses and optimises the digital appearance and ads (via SEO/SEA). Lastly, she also develops new ways to market My-Mountains offline. Corinne has been taken to the mountains since she’s been 3 months old and ever since she has been passionate about going to the mountains. During winter she’s an excited skier and snowboarder. While in summer she’ll be seen in the Swiss mountains mountaineering, climbing or hiking almost every weekend. And if there is time, she heads to great adventures around the word, from Kilimanjaro to Patagonia, from the Himalayas to the Dolomites. Hard climbs lead to great views. A tireless traveler, always looking for new places and destinations to discover. Simona has a background in languages, tourism and international trade. Today, she’s our sales area manager, responsible for developing sales strategies and creating warm and strong customer relationships. Furthermore, she provides feedback to the team based on data analytics, coaching sessions/observations and outcomes. If she loves the mountains, it’s because of her grandfather who transmitted his passion to her. Since she was a child, he always took her along narrow, tortuous, unusual paths that he only knew, until they reached the top. Since then, the first thing that comes to her mind when she has free time, is to escape to the mountains, looking for peaceful places where to stay in touch with nature and feel good. There is no greater satisfaction than to reach the summit, with your own legs, with your own strengths and enjoy the view from above after the effort of the climb. Giuseppe is our great creative thinker, IT guru and community builder with a strong sense of humour. He leads the IT department and creates and shapes the technology behind My-Mountains. Moreover, he’s tirelessly dedicated to develop, implement and improve the user experience of My-Mountains. Giuseppe inherit the love for mountains from his ancestors from Valtellina, a valley in north of Italy. Since childhood he succumbed to the charm and the majestic atmosphere of the mountains. Today, he loves snowboarding in winter and hiking and camping with his family in summer. Yin our Team you are in charge to push My-Mountains to the next level. When it comest to think you have no boxes whatsoever. Flexibility, determination, motivation and a natural leadership are your characteristics. Start-Ups are your environment and you love to generate and execute ideas. You’re hands on and love what you do from the soul. Mountain lover, you practice some mountain-related activities and, in your free time explore always new places. There are not problems, only solutions. Our growing international team is always available to answer your questions and offer personalised support.